Azure Storage Metrics provides a convenient way to access and visualize Microsoft Azure Storage Analytics data. 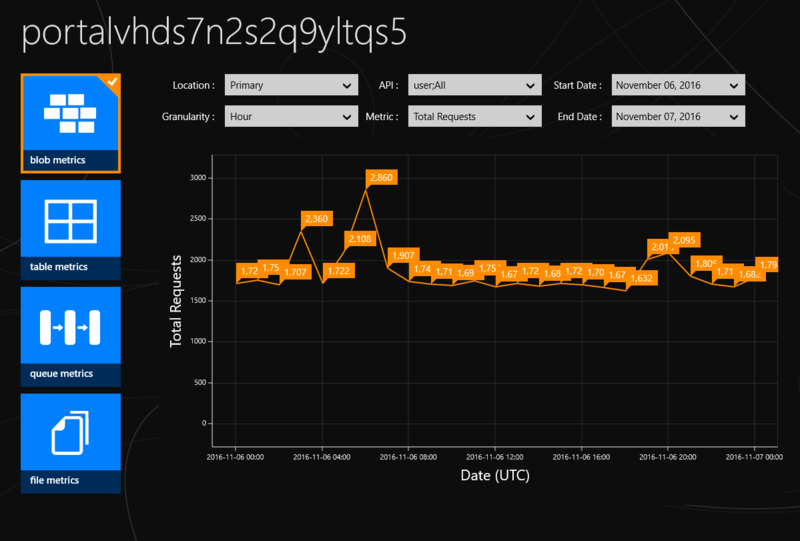 The graphs provide rich data insights into your blob, table, and queue traffic. Prefer Excel pivot charts instead? No problem. Easily export the data into an Excel spreadsheet which automatically includes the raw data, pivot tables, and charts. Monitor the blob, table, file, and queue traffic of multiple storage accounts. Visualize multiple data insights including availability, total requests, average latency, percentage success etc. Export analytics data to an Excel file which automatically includes pivot chart and pivot tables. Generate formatted spreadsheets with raw analytics data for arbitrary time periods. Monitor your storage account availability and isolate issues. Download arbitrary periods of analytics data for view or export. Modify analytics settings for the blob, table, and queue service including a retention policy.